Q: What are the rules regarding a landlord collecting an application fee? What if they don’t order tenant screening reports on that applicant? What about charging each roommate? Application fees are okay as long they relate to actual costs incurred by the landlord in leasing the rental — fees for a tenant background check and other related expenses. Landlords need to be careful, however, that the fee is kept to a minimum. We have seen reports of landlords charging $500 or more for an application fee when tenant screening reports cost only a small fraction of that amount. State laws prevent a landlord from using application fees as a profit center. A number of states prohibit application fees beyond the cost of running tenant screening reports. Others limit the specific amount that can be charged–typically less than $40. In addition to the statutes regulating application fees, landlords should be aware that the practice of charging tenants these fees and then not running the tenant screening reports could constitute fraud, especially if the landlord never intended to order the reports. View this as a “worst-case scenario” because fraud cases can generate civil penalties including punitive damages. That’s not to mention that by not running tenant background checks on new applicants, the landlord is placing other tenants and the property at risk. Some landlords prefer to collect the application fee in cash. One reason for this would be to speed up the tenant screening process by not having to wait for a check to clear. However, the landlord who accepts cash is missing out on an opportunity to collect valuable tenant screening information which may be on the face of a check. The check also serves as a receipt. Regardless of the method of payment, the landlord should provide a receipt for the application fee to cut down on any misunderstandings that could arise. If the application is for multiple occupants, the landlord can–and should, conduct a tenant background check on each adult. The landlord can charge an application fee from each person to cover the cost. Any time that the landlord has charged an application fee and does not run the tenant screening reports on an individual for whatever reason, that cost should be refunded to the applicant. This would be true if one of multiple roommates is rejected before other reports are ordered, and also if the landlord has accepted multiple applications for the same unit. If a landlord is charging fees during the application process, it is important to make clear what those fees are for. Perhaps the landlord has been paid to hold a vacancy open for a period of time while the applicant comes to town to tour the property. That is not likely to be construed as an application fee. However, if the fee is something that is charged each time someone applies to rent a property, the landlord should follow the local rules regulating application fees. For my prospective tenants, it’s an application deposit. They get it back unless I process their application and they then back out. This makes them more likely to apply. The fee is trivial compared to monthly rent, so renting sooner is a net gain for me. I don’t charge a fee. It’s a small price to pay to avoid a lot of headaches later on. Running a credit and background report are for my benefit..it could help prevent losses later on! How can I find a tenant who didn’t pay rent and I obtained a judgment on them, but don’t know where they are or work, so that I can file the judgment with their employer. I have their name and SSN. You can skip trace them to locate them. Accurint and Merlindata are two big skip trace firms on the internet, but just Google skip trace and you will have a lot of different choices. Not sure if they give employer information, so once you know where they are living you might have to have some investigage them further to find out their employer. Best of luck! Hope you find them so you can get the money that’s due to you! Hi, I have tenants(married couple and a kid) who have lived in my rental property for about 4 years not. When they first sign contract I didn’t ask for ss# now in July they have to sign a new contract. Can I ask for their ss#? Which is the best way to ask without breaking the law? By the way I live in New york state. Your feedback will be appreciated. Hi Paul… I am providing you with a link that will give you some valuable information regarding landlord/tenant rights & responsibilities in the State of NY. Your Question: Can you ask the tenant for a SSN during the application of a new lease? That question begs a question…will you be conducting a new tenant screening? What is the purpose for requesting the SSN? If you do not require it for any other purpose than to merely have it on file, then I would suggest you don’t need it. Do you have the DOB on file? If so then you likely don’t need the SSN. I couldn’t find anything in my re-search that says you can’t ask for it…you can ask for it if you wish, the applicant does not have to provide it as it is not mandatory for you to have it and does not assist in establishing tenant worthiness or credit worthiness. Name/address/DOB is what you need to establish the identity of an Individual for tenant screening purposes. An SSN is helpful in finding a file with the credit bureaus but not necessary. You will note in the link that was provided above that you cannot discriminate against age. The DOB is necessary though to find a consumer credit report and to identity the applicant. Just don’t reject the applicant based on age, that would be discrimination. Perhaps there are other Landlords that can weigh in here. I hesitate about charging application fee. What if after running credit, I decide not to take this tenant based on background information received, what should I tell him as a reason ? He might claim for the money to be refunded. I don’t want to get into trouble because of $25 application fee ! What’s your advice ? Thanks. I recently helped my 83 y/o mom apply for an apt. We paid $50 for a background check. For other reasons, we decided to not take apt. We asked to see if before she moved in buy were told we couldn’t. When I asked for the background check report or a receipt that it was filed, I was told they don’t give either of those back. Isn’t that fraud? 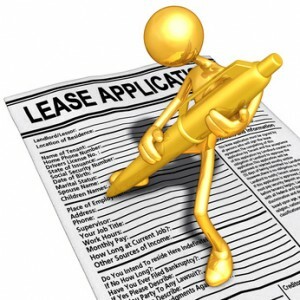 If I am an existing tenant and my one year lease is up do I have to sign another lease or should it be month to month? Also does the landlord have the legal right to ask for an application fee again? Sorry, In the State of New York. If you are charged an application fee and then turned down, can’t you get a copy of the report? My son was charged a fee and then said the unit was rented and refused to refund the fee. Then he see on line that the property is still up for rent. Isn’t that fraud and scamming? What are his options to get the money back or have the company checked for scamming? I just paid $225 for an application fee (for 3 adults) on a rental house in Cape Coral, FL. The background check came back saying I have 3 evictions–I have NO evictions! Although the agent has my SS#, bday and a copy of my DL, none of this was used to verify that this person (who has the same common name as me) is the one with the evictions. The agent basically told me this person could, or could not, be me but she wasn’t prepared to go any further with the application process. I called the two different courts (in IN and OH) about “my” evictions and the most recent one doesn’t even exist. The info the other court has is of an April Martin being evicted twice. They do not have access to any of this person’s identifying info to prove it’s NOT me. Help!!! I recently paid a $35.00 Application Fee for a property that should rent for much more then the advertised rate. I called the Realty Co. the following day and was told the person that ran the reports was out until after lunch. I ask if they would call after the report was completed and was told they might call that day, Friday, or it might be Monday. I heard nothing on Monday and called them on Tuesday, leaving a message asking them to call with results of the report, they did not return my call. I found this listing on Craigslist and verified that it is a legitimate business. Since touring the home and paying my application fee, I find that the house is also listed on several well know Real Estate sights. Because the home is in such great shape and priced below the going rates in Oklahoma City, I believe this company is accepting numerous application fees with no intention of checking them out! Is there a law against this, or at least away to get a refund of my application fee and warn others! My question is if we have the right to screen the “Proposed occupant” as well as an applicant or not. Applicant’s screen may come back “Approved/clear of credit and background check, but what about the rest of the family member that may be living in your property. One of them may have a criminal history. Can we request to the applicant to see if it’s OK to screen other member of family or no need to ask just screen them? What is our right as a landlord? I am a long term tenant , who has resided for 8.5 yrs.in an unregulated apartment complex in Guilderland, NY. My grown son and grandson whom he has joint custody of moved in with me so that I could help with child care. My grandson is here 4 days per week. My son lives here. I notified my landlord and listed both of them on my lease renewal, my son as an additional family member, not as .a leasee. The landlord is requesting an application fee from my son and wants to conduct a credit check on my son. There is nothing stated in my lease that additional family members are required to pay an application fee and I believe the landlord is mistaken about this. What do you think? HOA application is $150 per adult or $150.00 for married couple same last name. Can a HOA discriminate against married women who have chosen to keep their own names? I was told by a realtor that I had to fill out an application and pay a non refundable $35 fee prior to even touring a rental property. Is this even legal? If I’m not interested in renting the home what was the purpose of the application and fee? It doesn’t sound right to me!! $500.00 without approving a single attendant…..
potential renters in this way? Can a prospective landlord require you fill out an application prior to showing the property? Refuse to show it without approving your application first? I am able to screen any person using available public records. Do I have the right to charge a fee for my time while doing a research? Or I have to hire an outside company to do so? Next post: Crime Free Rental Housing Conference Scheduled for July–in San Diego!